The new SLASH formation and plays at the game in Glendale received universal derision from Oregon fans that were unaccustomed to the new look and at the subpar results. Yet Chip is not one to jettison a strategy after the first time and it aroused enough curiosity in me to study the different attack strategy behind these formations that could have significant relevance for the upcoming year. Is Chip changing the offense, simply adding another tweak, or will he bury these in the playbook? There are a number of reasons to believe we will see them again consequently, let’s examine the attractive components of this new attack unveiled by the Ducks. 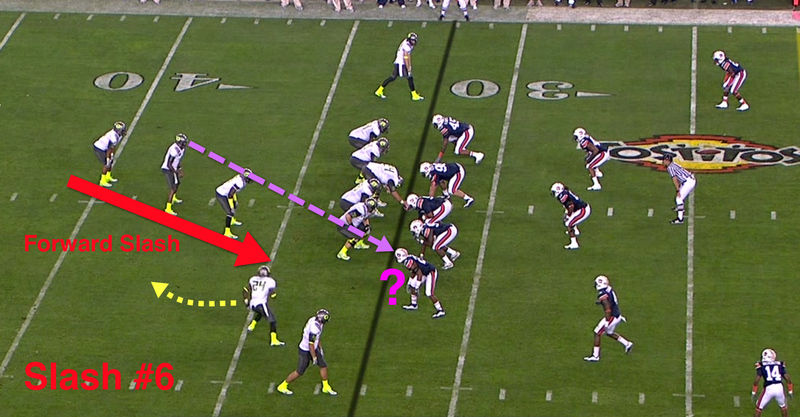 At the snap we have a triple option, but with a different flair than in the past. The slotback flanked out comes in motion from the left and goes behind the whole formation and then charges straight ahead. After Thomas takes the snap he is doing the mesh with this Dive Back and Zone Reading the Defensive End on our left, and since the play is going to that side–it is a Playside Zone Read which is different than the usual backside Zone Reads we ran throughout the season. The DE charged inside to the RB, and Thomas wisely pulled the ball and went to the outside. 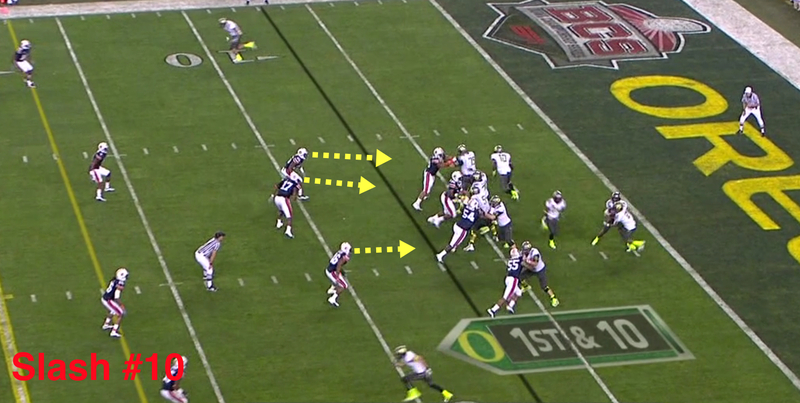 The H-Back who had been in the backfield on the left has now run around the left side and is leading the blocking. Darron is running into wonderful open space (above) and if he had gone forward and slid to on the oncoming DBs–then he would have gained nine yards. Instead he did something he’s never done the whole season, (above) which was taking off parallel to the left. He compounded the error with an awkward pitch to James who gained only two yards. We see the first variation off this new formation above at 8:40 in the 1st Qtr (above) that had me sitting up straight in my chair. We were lined up in the “Backward-Slash” () formation where we had two WRs flanked out left, and the H-Back in front and to the left of Thomas, and the RB behind him and to the right. 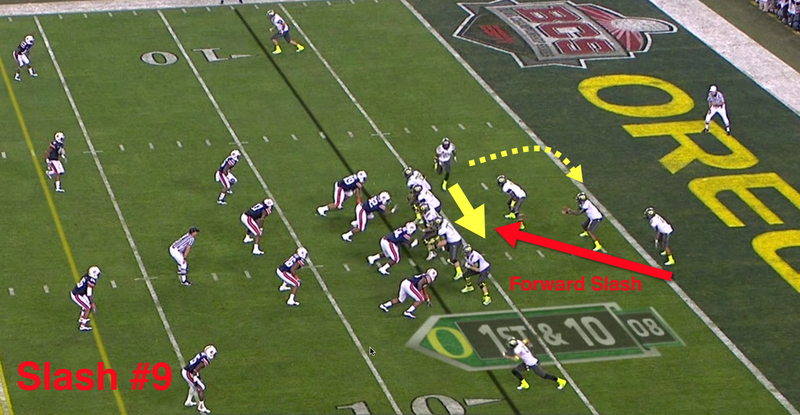 The slotback went in motion and came to the right and behind the formation to be the Dive-Back again. As Darron was handing off to him we see the H-Back fool everyone as instead of running outside and to the left and leading the blocking there–he moves to his right and leads the RB through the hole! The H-Back got a nice block on the Linebacker, which sprung the RB for nearly five yards on a dive play! The defense has to be so conscious of the outside, that they can get caught moving or leaning that way which allows us to set blocks other directions to take advantage of their anticipation. Let me get that right–wasn’t that like an old fullback leading the way in a traditional “I” formation attack? Yeah baby! I love it! I was wondering about the recruiting strategy of going after so many Tight Ends and H-Backs, and yet we didn’t throw to them as much as I would prefer. NOW I see what Chip is up to; a player like Lyerla who is 6’5″ and 240 can become one heck of blocking fullback on given plays, or he could be short yardage RB, (he WAS a RB in High School-think of the jump scoring play) or he can get open as a TE with his speed. The defense has to fear them coming out the backfield with a head of steam for a block, yet if they avoid the block–he may run past them on a pass pattern. The new formations make the H-Back/TE a very valuable player! So, we see a pattern emerge of the play going to the side of the two WRs, and at 6:13 in the 1st Qtr (above) we see Chip break that tendency. We’re in a forward slash formation, (/) (RB to the left and behind Thomas, and the H-Back in front and to the right) and the slotback is coming in motion from the right where both WRs began the play. 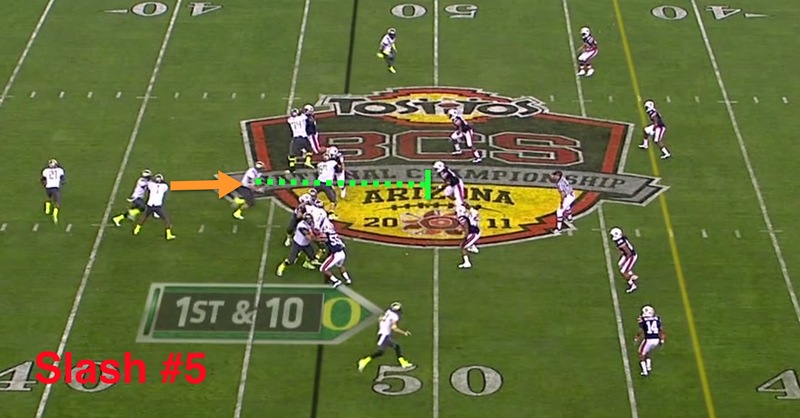 Usually this slotback would circle behind and be the Dive-Back with the play going to the side of the WRs or the right. 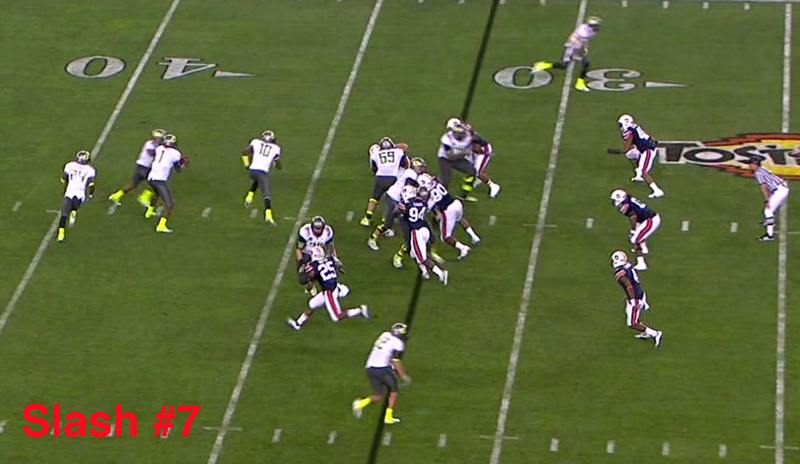 Note how it appears that we have an unblocked DE on the playside—the player to be Zone Read perhaps? But this time Thomas goes LEFT and the RB is the Dive-Back, and the slotback in motion is the pitchman going to the left. The playside DE is unblocked and is sucked inside to follow the Dive-Back and Thomas makes the right Zone Read and pulls the ball out and runs outside down the LOS; he then steps inside to cause the outside defenders to move in to stop the QB. 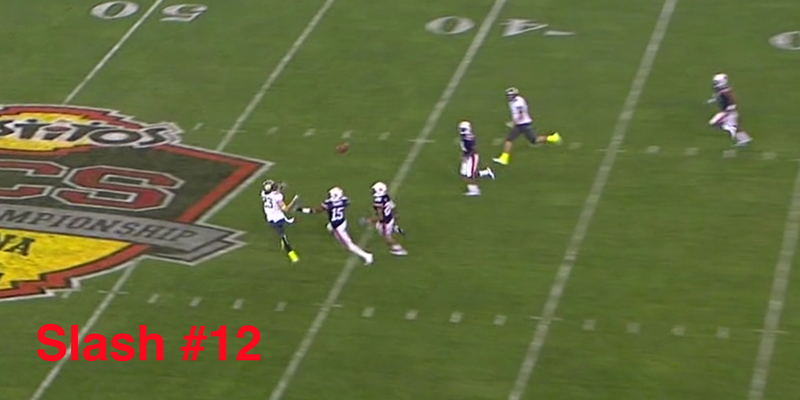 No sweat as he flicks the ball out to the pitchman and it grabs an easy five yards on first down. We can triple option EITHER way out of a forward or backward slash formation? That is a ton of pressure to put on a defense as we can attack either direction, and inside or outside! Holy Crap. I just about lost it all at 11:55 in the 2nd Qtr as we were on our own seven yard line and was trying to dig out of the shadow of our own end zone. We had the new Forward-Slash (above) formation, (/) (Two WRs right, H-Back to the front and right of Thomas, with the RB behind him and to the left.) and the slotback on the right goes in motion-but wait! He is not going back behind the backfield to be a Dive-Back; he is continuing across the field from right to left as if it was a sweep coming or Outside Zone Read. Immediately we see the Auburn defense shift that direction, (above) as we see the RB come forward like he is going to be a Dive-Back. Thomas throws a beauty downfield to Maehl for 81 yards, which resembled the long pass against USC from the same spot on the field. Now we have a new formation to confuse teams with! Running? Passing? Outside or Inside? There are TONS of spinoff plays from these new “Slash” formations! Wow. Do we really need FIVE Running Backs? 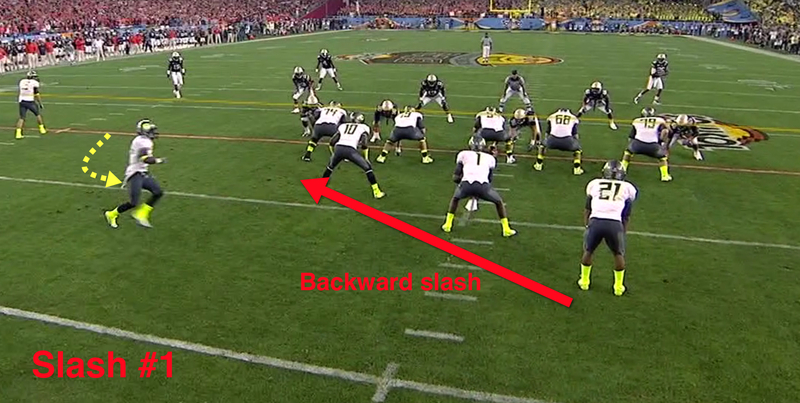 When we use the “Slash” formations–absolutely. 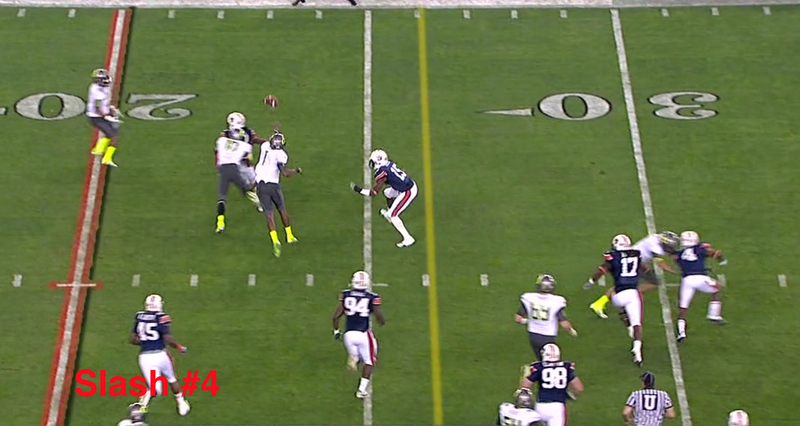 Note how LMJ or Barner were the slotback coming around as a pitchman or circling behind to be the Dive-Back. The RB played the other part, thus a “Tazer” has taken a huge step up in usage and importance in our offense with these new formations. The fact is we couldn’t have run these formations with the injury situation at times in 2010, and the addition of Seastrunk and DAT (DeAnthony Thomas) this next year will make running the “Slash” formations easier as both RBs can be Tazer or traditional Tailback and on the field at the same time. Again, the recruiting is being tailored to where our offense is going, and that is UP!